uuid : 1f0abc78-8899-4ae1-8b78-07ec8f70c742 templates_id: 119560 templates_uuid: "f8be253d-6974-46a7-ad51-d03839639ece" title: "Landlord\'s notice - Exclude security of tenure" display_name: "Landlord\'s notice to exclude security of tenure" description: "
Use this landlord\'s notice to exclude security of tenure when you do not want tenants to re-lease your property once their current lease is up. This landlord\'s notice to exclude security of tenure states that a tenant forfeits the automatic right to another lease when their existing lease comes to a natural end. This notice also covers when the contract is completed but not yet signed and when the tenant has not moved in yet. The legal information that must be covered when dealing with security of tenure is included in this document. What is a notice to exclude security of tenure? Security of tenure gives a tenant the right to remain in the property, i.e. to renew their tenancy when the commercial lease comes to an end. A notice excluding security of tenure is the formal notice by which a landlord decides to exclude the tenant\'s statutory right to a new commercial lease when the existing lease comes to an end. Why do I need a notice to exclude security of tenure? If the landlord does not expressly exclude security of tenure, the tenant will have a statutory right to a new lease, and the landlord can only refuse to grant a new lease on certain strict grounds. Issuing a proper notice to exclude security of tenure ensures that the tenant waives their right to stay in the premises when the lease ends. What are the consequences of excluding security of tenure? will be unable to claim compensation for the loss of their business premises (unless the lease specifically gives such right). When should this notice be sent? The decision to exclude security of tenure should be made at the start of negotiations between the landlord and the tenant, when the tenant has not moved in yet. The notice to exclude security of tenure should be issued at least 14 days before the start of the lease, ie when the lease is agreed and ready for signature, but not completed yet. What should the tenant do after receiving the notice? If the tenant receives the notice at least 14 days before committing to the lease, they\'ll need to sign a declaration stating that they have received the notice and that they accept its consequences, before signing the lease.
" created_timestamp: "2018-10-08 04:36:56.0" modified_timestamp: "2018-10-08 04:36:56.0" active: true created_by: 104 modified_by: 104 dcm_id: 336 url_slug: "Landlords-notice-to-exclude-security-of-tenure" meta_description: "Use this Landlord\'s notice to exclude security of tenure. Find everything you need to know about excluding security of tenure right here. Let Rocket Lawyer show you how." time_to_complete: "10 minutes"
Use this landlord's notice to exclude security of tenure when you do not want tenants to re-lease your property once their current lease is up. This landlord's notice to exclude security of tenure states that a tenant forfeits the automatic right to another lease when their existing lease comes to a natural end. 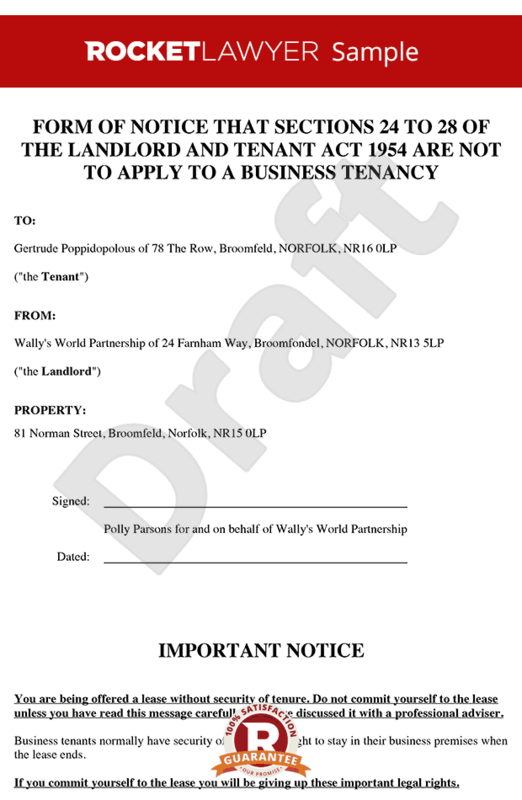 This notice also covers when the contract is completed but not yet signed and when the tenant has not moved in yet. The legal information that must be covered when dealing with security of tenure is included in this document. A notice excluding security of tenure is the formal notice by which a landlord decides to exclude the tenant's statutory right to a new commercial lease when the existing lease comes to an end. If the tenant receives the notice at least 14 days before committing to the lease, they'll need to sign a declaration stating that they have received the notice and that they accept its consequences, before signing the lease. This is governed by the law of England and Wales. More than just a Landlord's notice to exclude security of tenure template, our step-by-step interview and guidance makes it easy to create your document. Easily create online, download, print and sign your free Landlord's notice to exclude security of tenure in minutes. This document is also sometimes called: .